24 Hours in Police Custody (Channel 4, 9pm) Series 4 of the documentary series following Bedfordshire Police. Murder in Paradise (Channel 4, 10pm) Documentary about the murders of two British backpackers in Thailand back in 2014. Elizabeth at 90: A Family Tribute (BBC1, 9pm) Special to celebrate Queen Elizabeth II's 90th birthday. ★ Aliens: The Big Think (BBC4, 9pm) Documentary about the likelihood that aliens exist and what they might look like. ★ Flying Scotsman with Robson Green (ITV, 9pm) Documentary where the presenter and actor spends a year with the team employed to rebuild the famous Flying Scotsman train. Arnie Schwarzenegger's 50 Greatest Ever Stunts (Channel 4, 8pm) Countdown of the action icon's favourite movie stunts. ★ Shakespeare Live! From the RSC (BBC2, 8.30pm) David Tennant discusses the life, work and legacy of William Shakespeare with luminaries like Judi Dench, Ian McKellen, Meera Syal, Rufus Wainwright, Tim Minchin, Joseph Fiennes, and others. 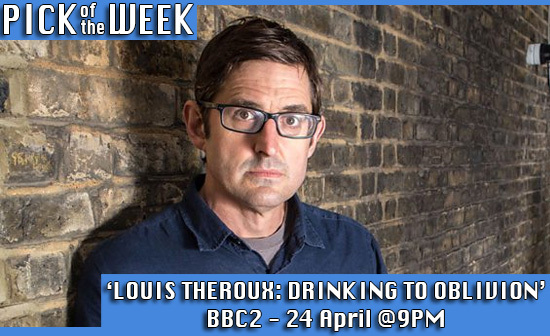 ★ Louis Theroux: Drinking to Oblivion (BBC2, 9pm) New documentary about the patients of King's College Hospital, London, who are being treated for drink-related issues. why not read and bookmark my TV Calendar?